During CUNA's ACUC, Mark Sievewright discusses the importance of digital relevancy for credit unions. Mark Sievewright presenting "Becoming Digital: The Path to Frictionless Financial Services" at CUNA's ACUC in Las Vegas. 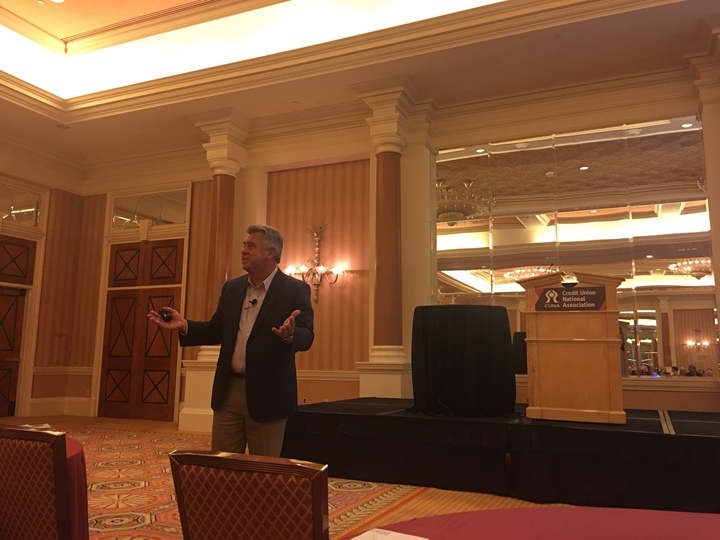 LAS VEGAS – Early in his session at CUNA’s America’s Credit Union Conference Monday, Mark Sievewright read a group text conversation he had recently with his three children aloud to attendees. In the conversation, he mentioned he had a 90-minute presentation scheduled at the conference, to which one of his kids replied that he couldn’t possibly hold anyone’s attention for that long.